We invite you to spend your holidays in the heart of Tuscany, in the middle of Val d'Elsa, in the village of Badia a Cerreto, at 5 minutes from Certaldo and 15 from San Gimignano, surrounded by wonderful country of Tuscany and surrounded by the most beautifull cities of art like Florence, Siena, Lucca, Pisa Volterra and others, in a flat with indipendent entrance, elegantly furnished and with a lot of confort, right for a holiday of culture and relax. Lovely location with lovely hosts. Wonderful stay in beautiful Tuscany. Maria Luisa could not have been nicer. Lovely break. This was an excellent central location for a visit to the quaint Tuscan hilltop towns of Volterra, San Gimignano (not to be missed) and the medieval town of Certaldo. The property was in a rural area, very beautiful and quiet. 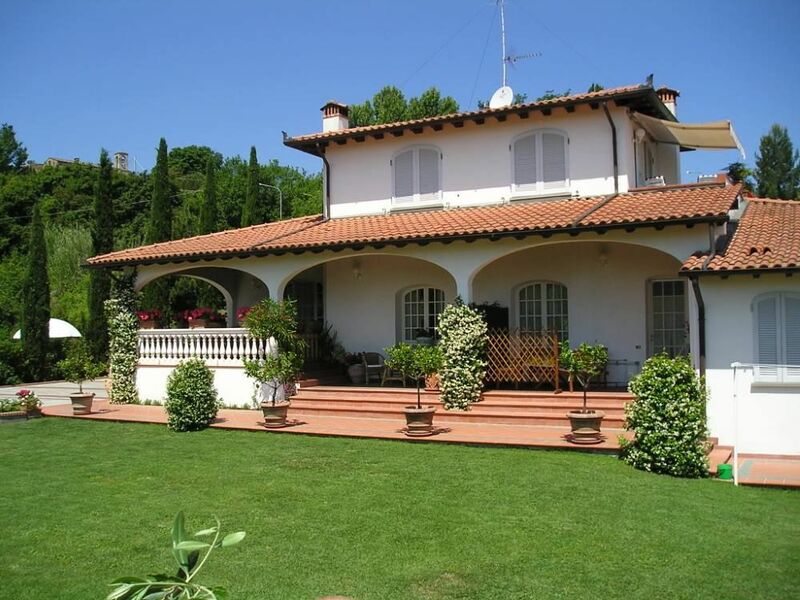 Maria Luisa and Giuseppi maintain a lovely home with a gorgeous view of the Tuscan hillside. There are many places on the property to sit, relax and take in the stunning view. Unfortunately, the apartment, small though clean and modern, is a basement apartment, with few windows and no view--a real disappointment for us. Also, there are many steps to navigate to reach the apartment. Our other complaint was that , unlike other VRBO properties, there were no supplies in the pantry (coffee, sugar, tea etc. ), although Giuseppi did present us with a bottle of local wine. With this said , we could not ask for better hosts than Maria Luisa and Giuseppe. They were lovely people and very welcoming. They went out of their way to help us whenever we needed them. For these reasons, I would recommend this property to other VRBO guests. They Rescued us. Such kind people. We were eating in a restaurant in Certaldo and trying to contact the B&B where we had a reservation. The staff were very kind trying to help us contact them. After no luck a gentleman came out of the kitchen and told us his family had a B&B close by. He took us here and it is so charming! We are in the smaller apartment. It has everything a person could need. Highlights are a large, well equipped bathroom with a Jacuzzi tub. Very nice kitchen with a washing machine. The host is lovely and has already called to check in on us this morning. Terrific price. We had a great stay at le Ginestre. The owners are very welcoming and kind. The apartment is very well and with great taste furnished. We loved to stay in the beautiful garden with great view at the pool. Nous venons de passer une semaine dans l'appartement Michelangelo avec nos 2 enfants. Le logement est très bien équipé et confortable. Il y fait également toujours frais. Nous avons bien apprécié la piscine et l'espace barbecue. Enfin nous avons eu un très bon accueil de Giuseppe et Maria Luisa, très à l'écoute et généreux. Nous recommandons cette adresse idéalement placée pour visiter la Toscane. La famille Noyalet.